Used to be that if you got a population of over 20 you had a big city in Civilization. That was until Civ VI came along and changed everything. One of the new game’s features is that many of the districts you can build will share their benefits with neighbouring cities. This allows for some fairly strategic urban planning. And also an absolutely ridiculous megalopolis when the value being shared or influenced is people. Procblocked built this enormous settlement by disabling a custom game’s victory conditions and focusing all his efforts on expanding the size of his capital. 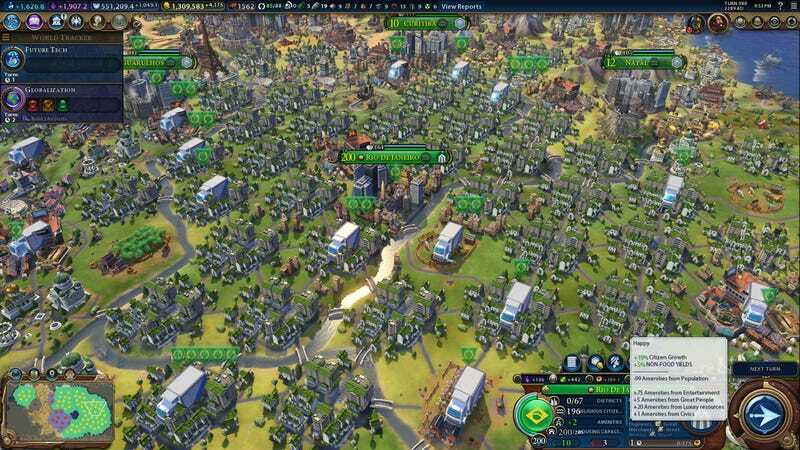 Without using any gameplay mods or cheats, he’s managed to build Rio’s population to 200 in Civ’s values. Or, in real world figures, around 2.7 billion people. The overall idea was to build a series of ringed cities around the capital each with overlapping areas of control, inside which there are 30 neighbourhood districts, 20 stadiums and 80 trade routes supplying the 750 food the city needs to survive. This overhead plan shows how everything had to be laid out for this to work. If you want to try something like this yourself, Procblocked explains in detail how it was done here.